As I write, the boar, the ram, and the bull are all outdoors in their respective breeding groups. We have lucked out finding very well mannered male animals this year. 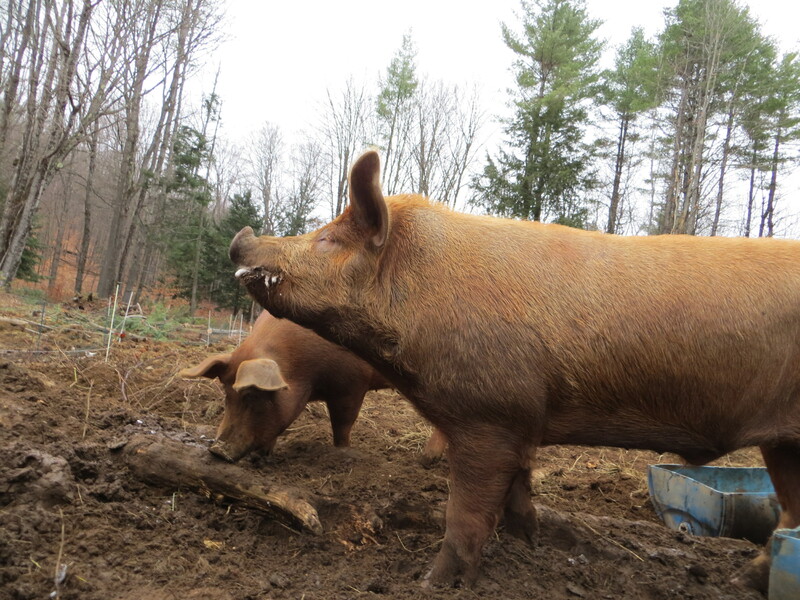 The Tamworth boar is exceedingly calm – Eben always says hello to him at chore time. Our Romney ram, whose maturity and virility was in question, appears to have figured out the birds and the bees. And finally, our newest addition, a young Angus bull (who Gabe has named Angus King in deference to the political season) has joined our herd. We are hoping the Angus genetics will increase the growth rate of our future calves. The bull is peacefully sharing his new winter quarters with the remainder of the herd – here is where Gabe breathes a sigh of relief as cattle moving can be stressful. If all goes well, we should have March piglets, April lambs, and (late) August calves! Another large project around the farm has been the construction of our new milk shed, which, by the time you are reading this, will house Jeannette our new milk cow. A 3-year-old Jersey, Jeannette comes to us from Blythedale Farm and is due to freshen on January 3. We are incredibly excited to welcome Jeannette to our farm and looking forward to morning and evening milking with the boys, fresh milk at all times, and all manner of homemade milk products from our own kitchen…butter, yogurt, cheese, and ice cream galore. If you are in the market for raw milk, we will have an abundance come early January. Let us know if you would like more information!